Six months have now passed since the two massive earthquakes that struck Nepal on April 25 and May 12. 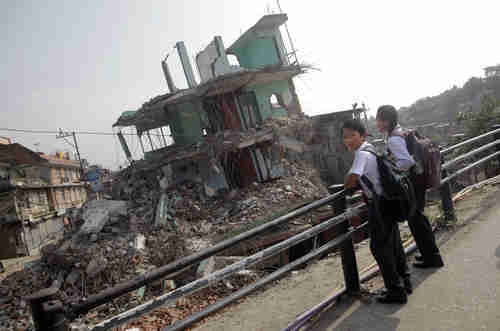 More than 8,800 people were killed, and 600,000 homes were flattened. Millions of people were left with inadequate food, clean water and shelter. The earthquake generated an international rush to provide aid to the victims. More than $4 billion was donated in the aftermath. Now the international community has forgotten the earthquake. Each affected household had been promised $2,000 in aid, but has received only about $150, barely enough for food. There's no aid for clothing and shelter to get through the winter. The earthquake came at a time when the government is in a state of almost total paralysis, because of a constitutional transition from a Hindu monarchy to a secular republic, which itself triggered massive demonstrations and economic blockades by the Madhesis, a mostly Hindu ethnic group in Nepal's Tarai region on the border with India. On September 17, Nepal's Constituent Assembly adopted a new constitution that replaced the Hindu monarchy with a secular republic, and which marginalized the Madhesis, a mostly Hindu ethnic group living in Nepal's Tarai region on the border with India. This triggered massive demonstrations by the Madhesis, who blockaded the truck traffic passing between India and Nepal starting on September 24. In particular, this cut off the only source of imports of petroleum and cooking gas to Nepal, as well as many other goods. There are presently over 6,900 trucks and containers stuck at border points that the two countries share. Without petroleum, major sectors of the economy have been shutting down, including manufacturing, transportation and farming. Attempts by the Nepali security forces to reopen the borders have been met with violence, with Nepal police sometimes firing into the crowd. Dozens of people have been killed. The blockade on the border between Nepal and India began as a protest by the Madhesi ethnic group, but as the blockade worsened, Nepal's government began accusing the government of India's president Narendra Modi of supporting and even participating in the blockade, something that Modi vehemently denies. There's no doubt that Modi strongly opposes Nepal's new constitution, and may even feel betrayed. Shortly after coming to power, Modi visited Nepal in August 2014, and was warmly received by the entire population. India was the first country to help Nepal when the earthquake struck in May. But the relationship soured quickly when the new constitution was passed. The mostly-Hindu Madhesis constitute about 40% of Nepal's population. The new constitution contains clauses specifically designed to limit the Madhesis' representation in the new parliament to around 10%. Furthermore, the new constitution contains clauses that are ethnically offensive, such as denying citizenship to many Madhesis and their children. As the date approached to vote on the new constitution, Modi lobbied the Nepal government make several changes, such as to restore the wording of the old constitution that calls for "proportional inclusion" in the government, and to permit citizenship by birth of naturalization. When the new constitution was passed with none of these changes, the border blockades began. "India is playing with fire. Instead of encouraging the Madhesis it should calm tempers and ensure that this problem is resolved amicably. It is not something that cannot be worked on and solved to the satisfaction of all. New Delhi will be blamed if the situation takes an uglier turn."